Assuming you have an Internet or network connection set up, let’s run through the steps necessary to configure NetMeeting. Begin by selecting Start, Run, typing conf in the Run dialog box, and then clicking OK. The first time you do this, Windows XP launches the NetMeeting Wizard. Follow these steps to use this wizard to configure NetMeeting. If you plan on using NetMeeting regularly, consider setting up a shortcut for it on your Start menu (for instance, in the Communications folder). The Conf.exe file is located in the %SystemDrive%\Program Files\NetMeeting folder. The initial dialog box just gives you an overview of NetMeeting’s capabilities, so click Next to proceed. The next dialog box asks for some personal data. At a minimum, you have to specify your first and last names and your email address to coax NetMeeting into continuing. (Don’t worry: you can tell NetMeeting not to publish this information if you’d prefer to be incognito.) When you’re done, click Next. Log On to a Directory Server When NetMeeting Starts If you activate this check box, NetMeeting will automatically log you in to one of these servers at startup. Use the Server Name list to select the directory server. Do Not List My Name in the Directory Activate this check box if you don’t want the personal data you entered in the previous dialog box to be published on the server. Now the wizard wonders what connection speed you’ll be using for your NetMeeting collaborations. (Not surprisingly, the faster the connection, the better NetMeeting performs. However, for best results, you shouldn’t select a connection speed that’s faster than the one you’ll be using.) Activate the appropriate connection speed and then click Next. In the next dialog box, you can choose whether the wizard adds shortcuts for NetMeeting on your desktop and the Quick Launch bar. Click Next. NetMeeting now launches the Audio Tuning Wizard, which checks your sound card to see whether it supports full-duplex (two-way) or half-duplex (one-way) sound. First, make sure that no other programs that use your sound card are running. This includes Windows Media Player, programs that use the sound card to broadcast messages (“You have mail!”), multimedia software, and so on. When that’s done, click Next. The Audio Tuning Wizard first checks to see whether you have multiple audio devices in your computer. If you do, you’ll see a dialog box that enables you to select your Recording and Playback devices. Make your choices and then click Next. In the Audio Tuning Wizard’s next dialog box, click Test to play a sound, and then adjust the Volume slider to taste. Click Next when you’re done. You use the next dialog box to adjust the input (microphone) volume. Make sure that you have your sound card microphone plugged in and at the ready. Then speak into the microphone using your normal voice (the wizard displays some suggested text to read). As you speak, the wizard adjusts the Record Volume slider automatically. Keep speaking until the slider stabilizes. When the recording is complete, click Next. Click Finish in the final wizard dialog box to continue loading NetMeeting. If the Windows Security Alert dialog box appears, click Unblock to stop Windows Firewall from blocking NetMeeting. 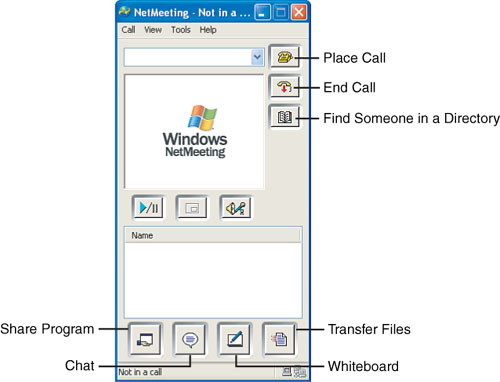 The NetMeeting window appears, as shown in Figure 1. Figure 1. When you finish your configuration chores, the NetMeeting window appears. In other words, Windows Firewall must be configured to allow TCP connections on ports 389, 522, 1503, 1720, and 1731.